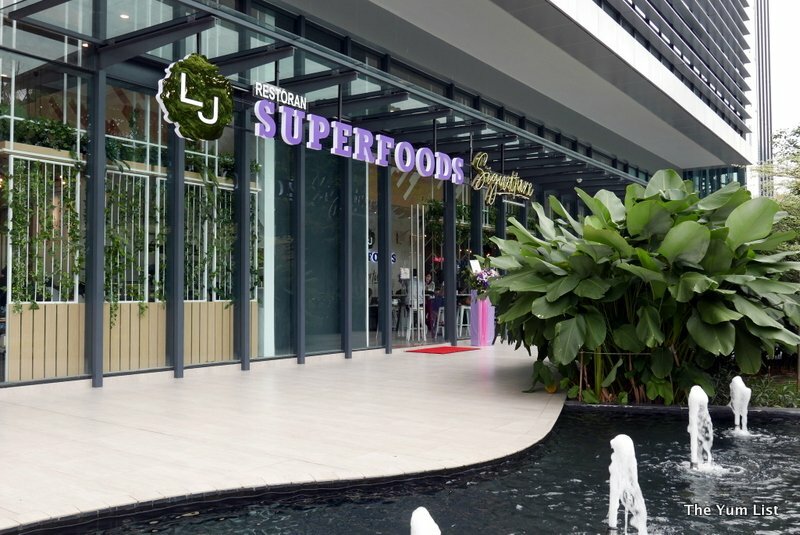 In line with their stellar trajectory, La Juiceria recently launched a new Superfoods outlet that will likely boost into hyperspace their already lofty reputation for high-quality, healthy food. 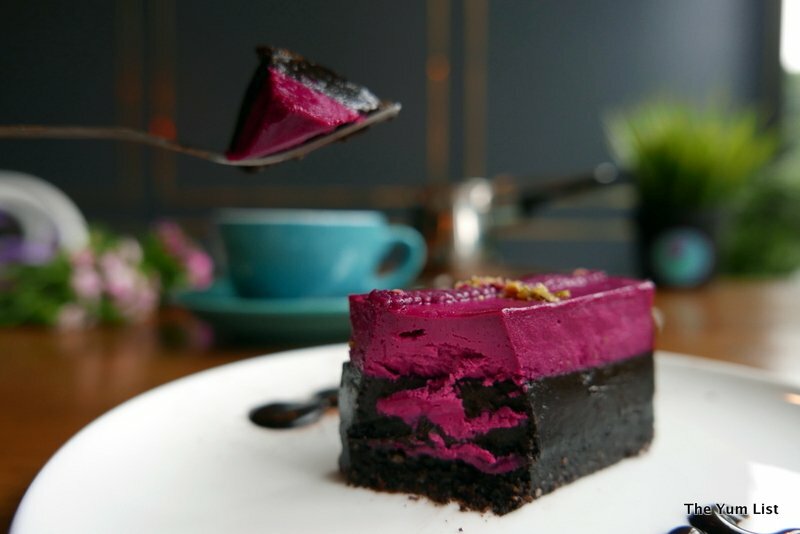 With its tall ceilings and top-to-bottom windows, Superfoods Signature breathes light and openness into an unlikely corner of Bangsar. Avoiding the malls, founder Annabelle and her partners wanted to develop a Melbourne-style cafe: Premium, but casual and affordable. The result is a large bright space with plants everywhere and a variety of comfortable seating. Families can sit near a playhouse for their kids. Work groups can reserve an oval table with a projectable screen at one end. Couples can find cozy tables to share a coffee. Clearly, something for everyone. And this does not just apply to the space! 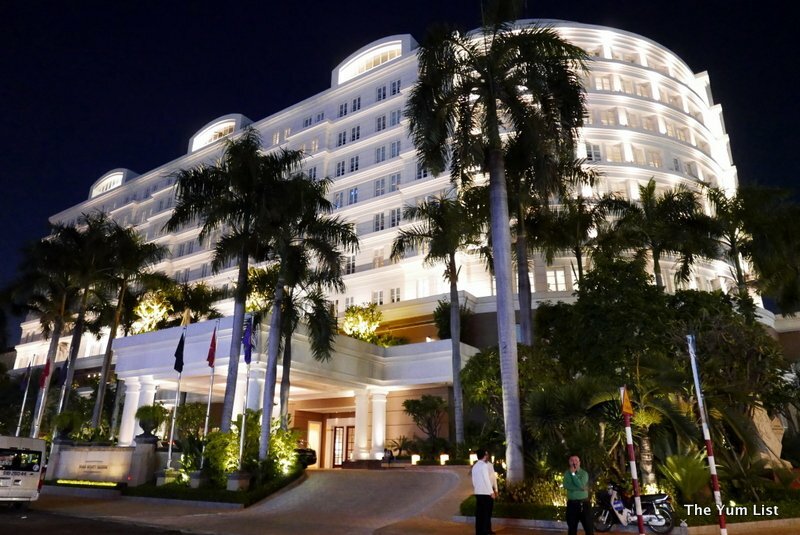 We were fortunate to have a chance to explore some newly-conceived items on the menu, as well as some old favorites from the Mont Kiara Superfoods. By noon on a Sunday, I was ready to dig in! Like all caffeine junkies, we began by choosing from a lovely selection of coffees, including some Melbourne-style treats. I loved the spice of the Turmeric Latte (RM12), with its aromatic sprinkling of cinnamon and (big surprise) turmeric. The Matcha Latte (RM12) was a smooth frothy indulgence true to its name, but my favorite of the three was the Black Sesame Latte (RM12). Rich and nutty, it was creamy and just sweet enough to transport me to days of eating black sesame ice cream in Japan. All of Superfoods coffees can be made with cow’s milk, soy milk, or their homemade almond milk. Breakfast lovers will find their footing with classics like Eggs Benedict (RM21) and the Big Breakfast (RM28). 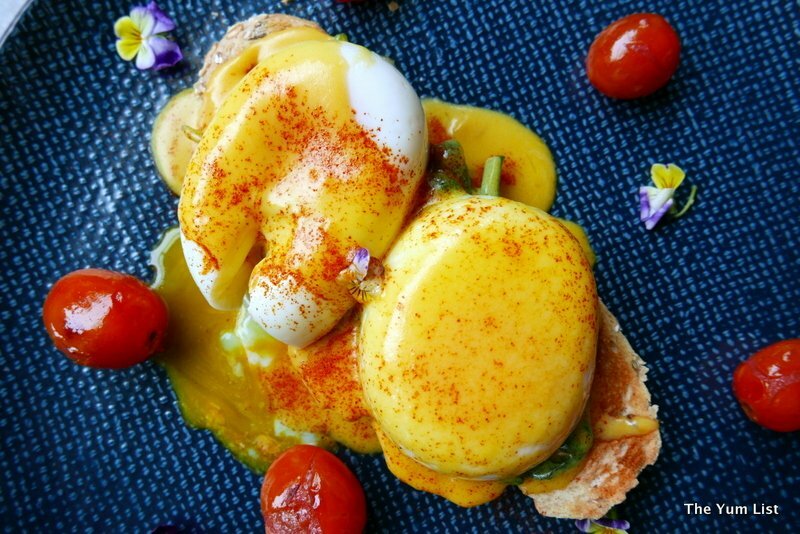 In keeping with Superfoods’ healthy philosophy, the Eggs Benedict substitutes spinach for ham, and dresses the kampung eggs with a bright hollandaise that looks very enticing against the blue of the plate. 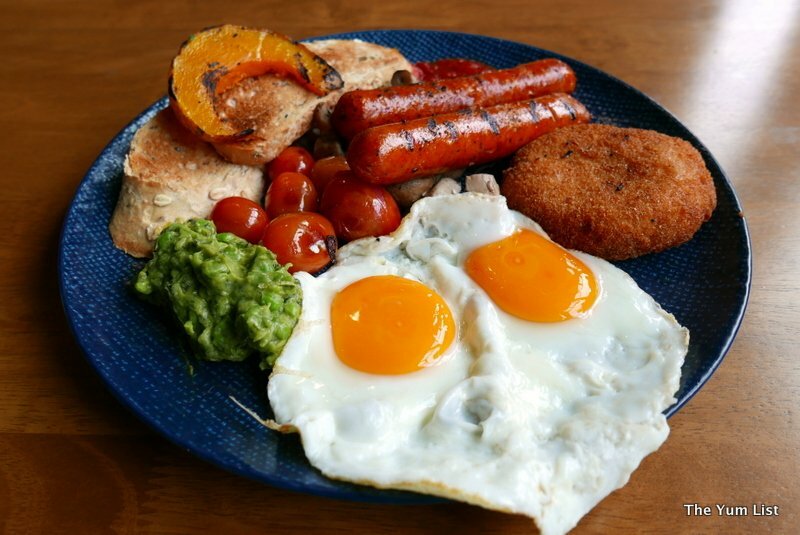 The Big Breakfast pairs the predictable choice of meat and eggs with healthier complements like avocado, pumpkin and roasted tomatoes. The hash browns were terrific – extra crispy croquettes with a creamy mashed interior. Yum and yum. Those looking to “mash” it up a bit will gravitate toward the Avo Mashed Greens (RM22) or the Smashed Sweet Potatoes (RM22). 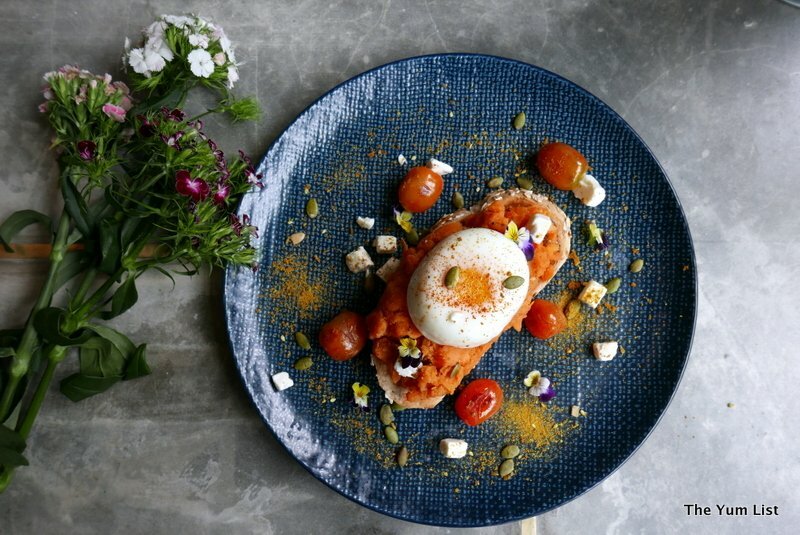 Both are served on toasty bread with a poached kampung egg on top and tangy feta crumbs on the side. 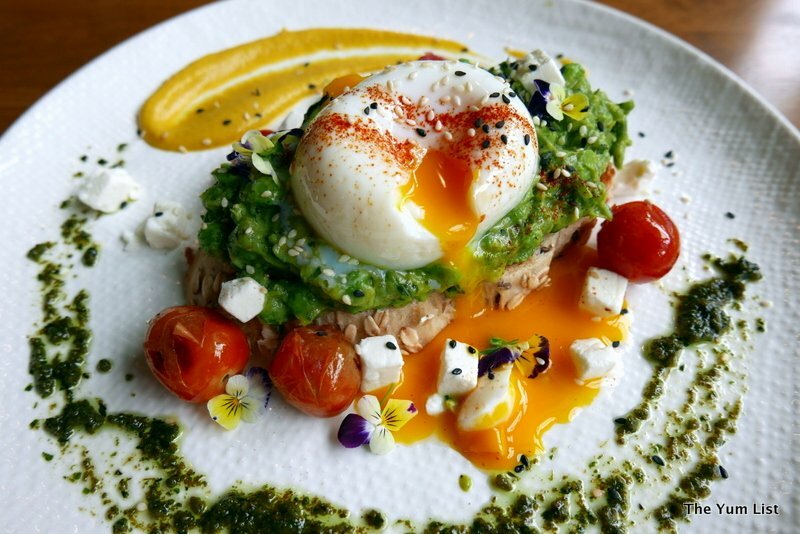 The avocado plate gains extra green from the inclusion of green peas to the mash, an interesting combination that adds a measure of sweetness and texture. Roasted pumpkin seeds and some dukkah spice enhance the sweet potato variety. Both were delicious. Those who prefer a sweeter breakfast will enjoy the French Brioche Toast (RM22). Thick slices of brioche are fried and topped with chocolate granola, salted caramel, and seasonal fruits. Avocado mash on the side brings color and variety. 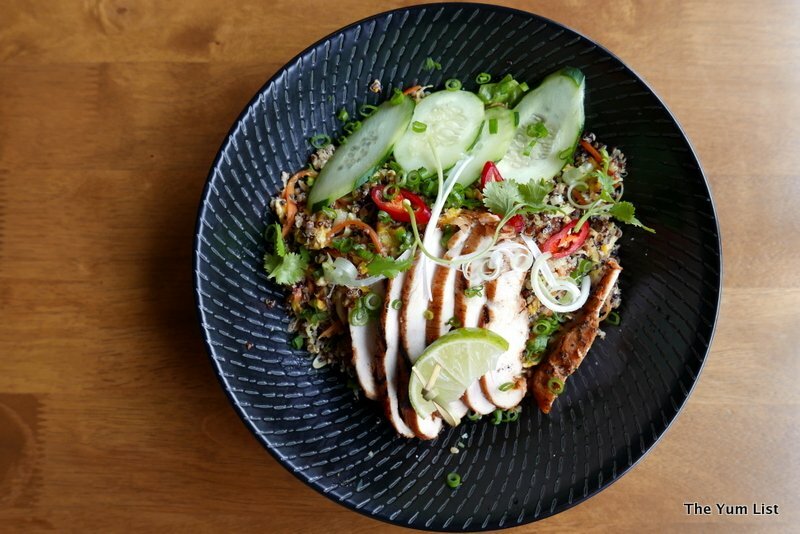 More traditional types will appreciate healthier adaptations of old standards like the Fried Rice Quinoa (RM24), one of five “Super Bowls” on the menu. Tossed with cabbage, eggs, carrots and a little coriander, this was my favorite dish of the day. Spice-rubbed grilled chicken added both flavor and protein. Sous vide preparation keeps all the chicken at Superfoods tender and juicy. Flexible clients will stretch toward the Build-Your-Own-Salad, with options in three sizes (RM18/22/26). The base may rightly be leaves, but might just as easily be rice, quinoa or smashed sweet potato. Toppings include a choice of proteins, and any three of a dozen vegetables. 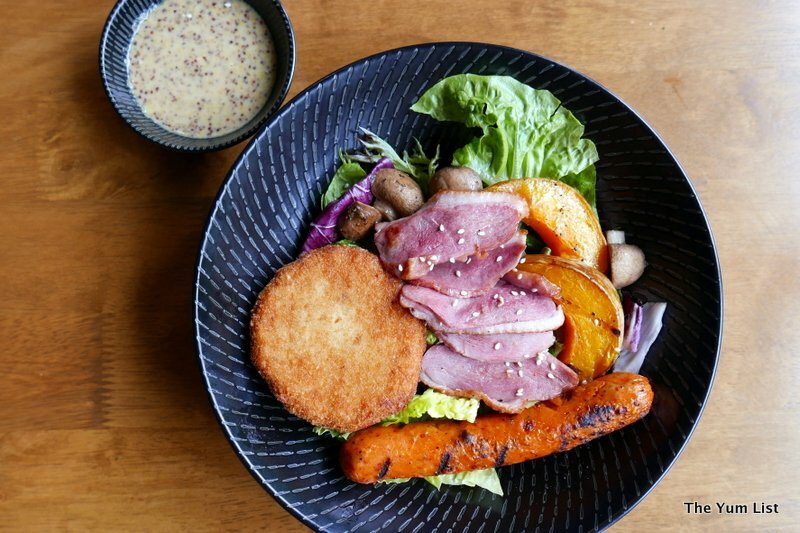 We chose mixed greens and added smoked duck, chorizo, roasted pumpkin, and hash browns – kind of like breakfast in a bowl! The honey mustard dressing was delicious, one of nine available. 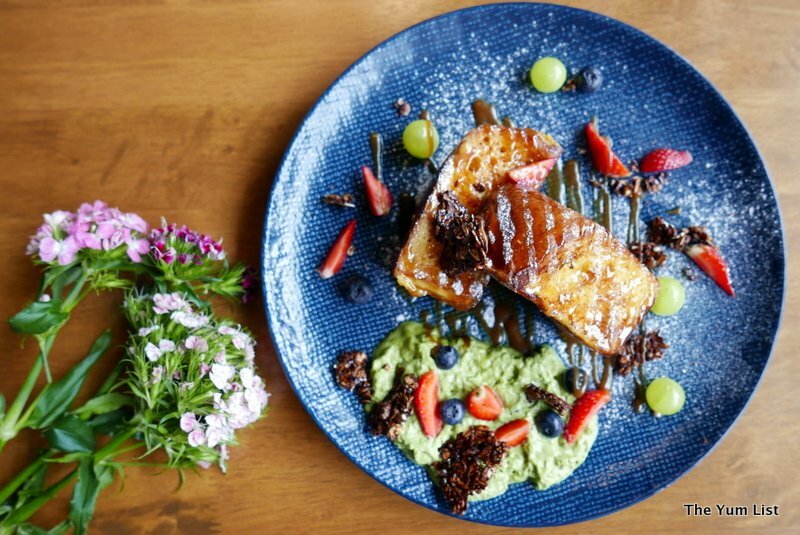 Dessert-lovers will wonder whether anything on a “Superfoods” menu might appeal to them. 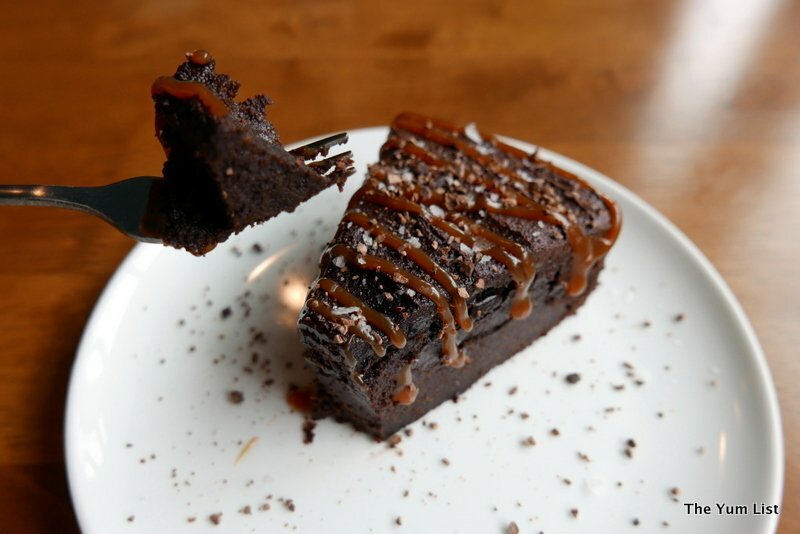 Not to worry: the gluten-free chocolate cake is dark and dense, adorned with caramel and crunchy toffee bits. Made with almond and buckwheat flour, this dessert is perfect for those watching their gluten. Alternatively (or maybe along with! ), Superfoods trademark raw desserts are available in many flavors. We tried chocolate raspberry and the heat of an oven was never missed. 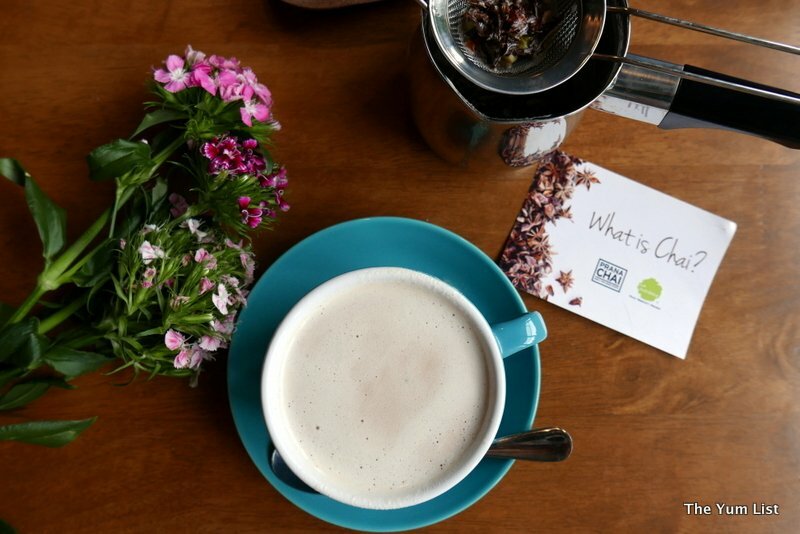 Alongside the dessert, tea drinkers will appreciate the selection of teas like Earl Grey and Green Tea Sencha, but will relish the hand-blended Prana Chai. Just like chai in India, whole spices are brewed with black tea and milk and poured through a strainer. An embrace of cardamom, cinnamon, cloves, and star anise wraps around your senses like a steam bath. 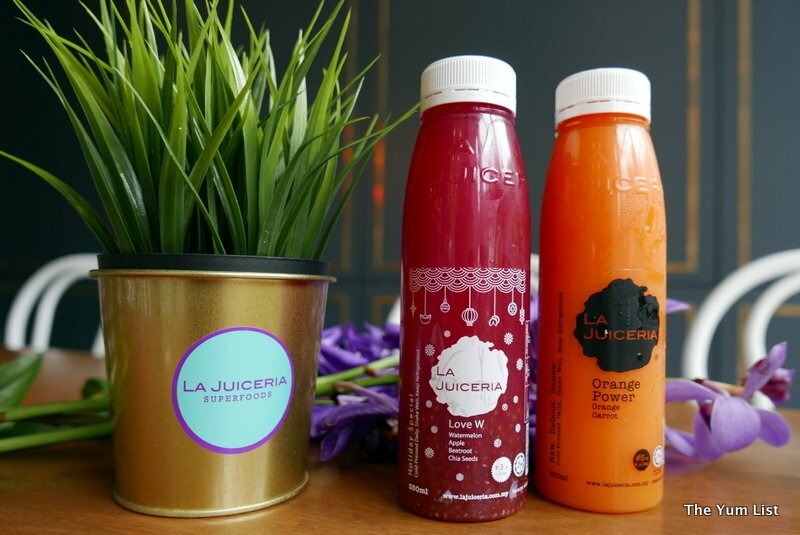 La Juiceria fans will be pleased to know that the signature cold-pressed juices and fresh-made smoothies remain the same as at their other outlets, served in-house or take-away. Caning tried a watermelon smoothie and found it light and refreshing. Have we left anyone out? We’ve covered newcomers and veterans, sceptics and fans, junkies and mashers. The launch of Superfoods Signature belies the gravity of narrow and unhealthy eating. Aim high with food choices, and in the end, find something for everyone you bring with you. 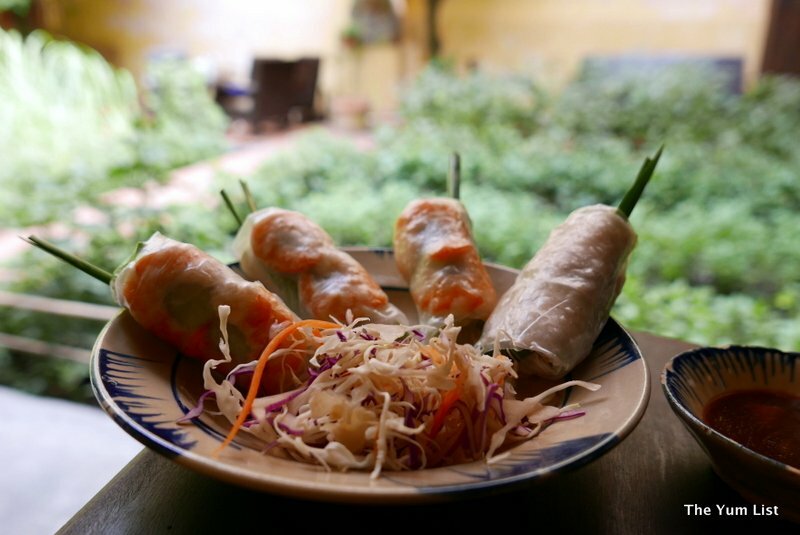 Reasons to visit: Healthy and delicious brunch and cafe foods with plenty of variety for every one of your friends. 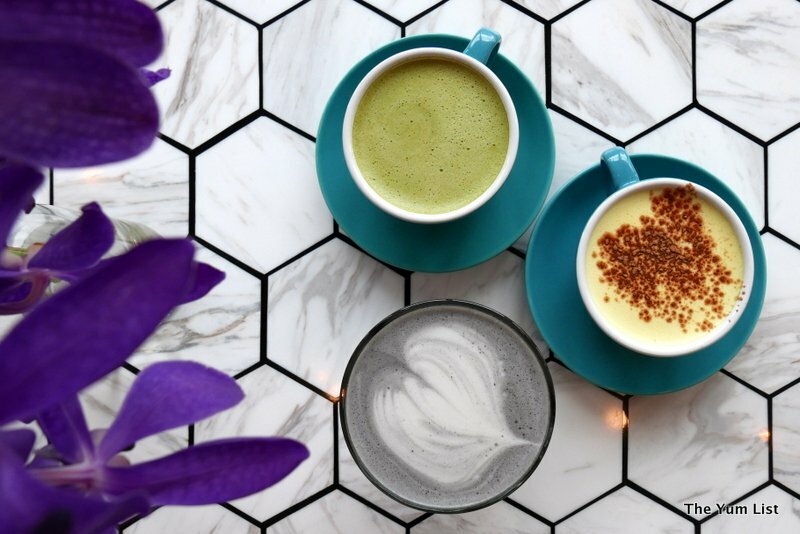 Don’t miss the Melbourne-style lattes, which include turmeric and black sesame, and the housemade prana chai. Superfoods Signature is open 8:00 a.m. – 10:00 p.m. daily. 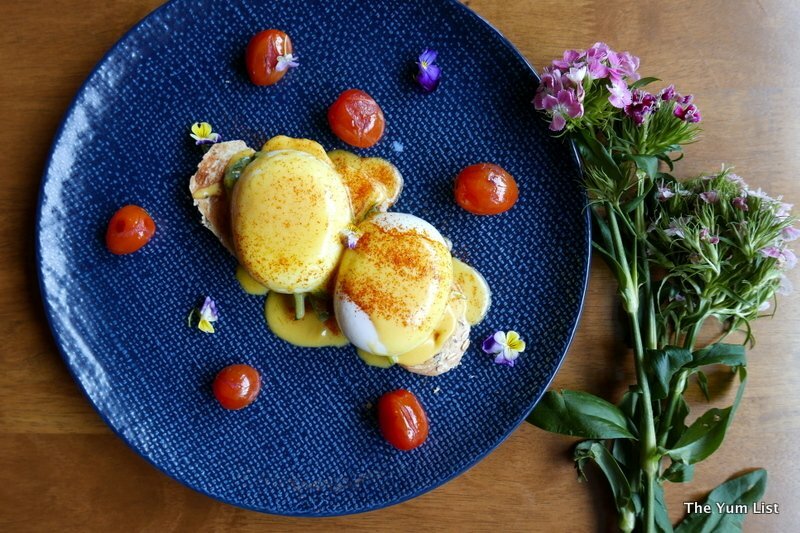 Egg Benedict is made right. Oh so good. Looks like healthy food is the ‘in’ thing. =P I’ve not tasted their juices or their food, but I’ve seen their standalone stalls in the shopping malls. The Black Sesame Latte would definitely be worth the shot – wonder how it tastes? Actually, the black sesame latte was one of our faves. I think as people become more educated and connected to themselves healthy foods are only going to become more and more popular.